Litterae is a unique collection of 24 high quality cards (full colour, 21x15cm / 8.3x5.9in), with handpicked texts from various Latin authors, translated, commented and calligraphically interpreted. The fronts of the cards feature the selected Latin quotations, each one in a different, appropriate writing style. The reverse side contains the Latin text and reference, along with translations (English and Dutch) and additional illustrations. With the set comes a 36 page booklet providing useful background information on the authors, their work and the chosen fragment. There’s also a short commentary about the calligraphic rendition of each card separately. 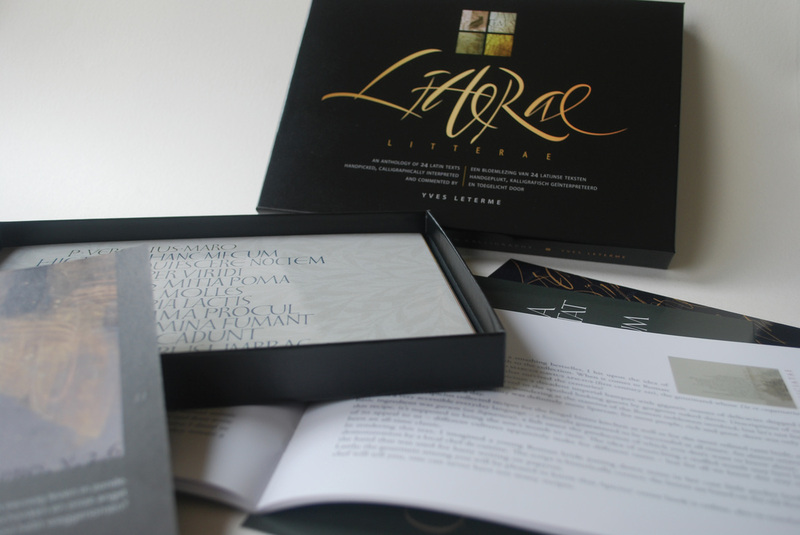 Cards and booklet, available in an English or Dutch edition, are presented in a stylish gift box, along with three Litterae bookmarks. Watch the trailer and/or watch the video on the making of the box. Couldn't be more easy! Once you've filled in the form below and pushed the submit button, we'll contact you by mail to inform you of the total cost and the payment method. Group orders get a customized discount, just ask for it. Thanks.